Whilst the title for this concert of early 20th century masterpieces may prove to be puzzling unto itself, along with the way the four composers chosen (Elgar, Sibelius, Ravel and Respighi) are drawn together into a program, there is little doubt that the Adelaide Symphony Orchestra and Principal Conductor Nicholas Carter are capable of highly detailed and virtuosic performances. From its opening Wagnerian brass flourishes, Elgar’s underheard ‘concert overture’ In the South (Alassio) is a highly personalised account of an Englishman in the sun-lit Italian Riviera, the very place where the composer conceived this attractive work. We forget just how influenced Elgar was by the late German Romanticism of Wagner and Strauss and often In the South seems to be somewhat more akin to Herr Richard’s tone poems. And yet the march and military precision that we associate with Sir Edward’s particular pomp is never very far away. Here was the perfect opportunity for the orchestra to display its individual strengths with highly impressive work from the string, wind and brass sections. Respighi’s Pines of Rome presented more chances to display the virtuosity of this orchestra and its exacting conductor. With its highly descriptive and colourful musical vocabulary, Carter proved to be a true painter in sound, bringing out many fine details within this highly descriptive music. And to think that it was perceived as a scandal at its premiere for including the recording of a nightingale as part of its highly descriptive catalogue. Ravel’s popular ‘choreographed poem’ La Valse, was originally intended to be called Wien (or Vienna) and while Carter and the orchestra presented a finely detailed performance, it was a little too neat for my taste, with the conductor focussing upon the big percussion to the expense of the work’s more subtle and often obtuse three-quarter rhythms. Here we should never forget that Ravel, as well as being the son of a Basque mother, was also the son of a Swiss watchmaker. The tempo chosen was broad and yet the piece needs an effervescent, giddy feel to be truly successful. 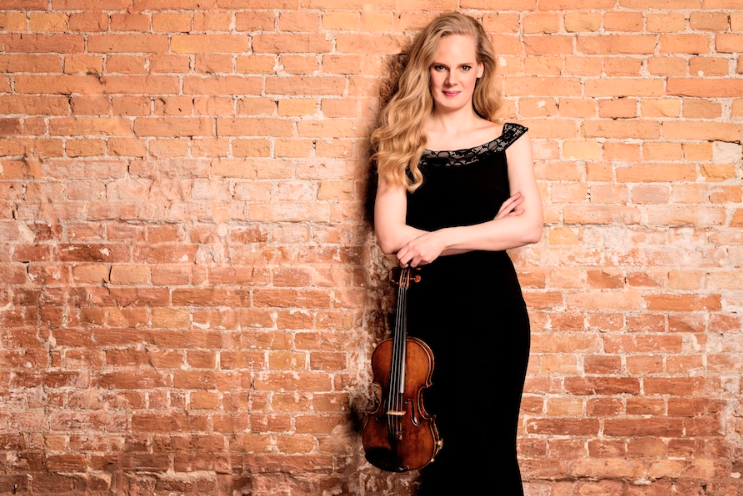 The Adelaide Symphony has a fine reputation as an interpreter of Sibelius’ orchestral oeuvre due to its award-winning cycle with Arvo Volmer, and the performance of the violin concerto with Dutch soloist Simone Lamsma did not disappoint. Carter gave perfectly balanced support to the violinist and from that broad and brooding opening melody with those ebbing strings, it was sensed that this was going to be a great performance – one weighted with great depth of feeling and a sense of purpose coupled with a seemingly limitless variety of tone colours and effects. Here was a performance which was as good as any recording of the concerto that I’ve heard and one which shows the history of the work amongst both Dutch and French violinists including the great Ginette Neveu who almost single-handedly introduced the work to the record buying public well over 60 years ago. This masterly take was followed by a movement from one of Paul Hindemith’s solo sonatas – full of identification, knowledge and technical infallibility. Lamsma is one of those rare musicians wherein the music seems to move through and transport her. Amy Dickson's Australian premiere of James MacMillan's Saxophone Concerto was an exciting inclusion in this terrific ASO concert. Brett Dean’s intense, immersive new opera makes for a thrilling start to this year’s Adelaide Festival.